There haven’t been many moths to my light the last few times I’ve set it out, even on the warmer, humid evenings. Something to do with the weather, maybe? The almost-drought from earlier this summer? I dunno. But what I did have a lot of one night were these guys. Praying mantises. At the point that I finally shut the light off and went to bed, well after midnight, I’d managed to attract 13 of them. Several clung to the sheet, others clambered up the log wall, one or two walked along the ground below the light. Equal numbers of both green and brown. I never saw any of them stalking (or holding) prey, though they did occasionally turn their heads to watch a moth walk by… like this one is doing. I love how mobile their heads are. I did a post about praying mantises a couple of years ago, the first summer we moved here. They’re abundant in our fields, and late August through September seems to be when the adults start taking wing. Which is mostly when I notice them. 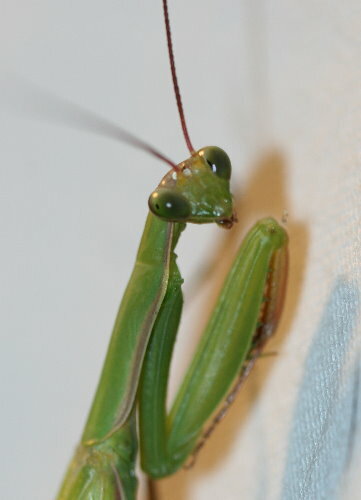 Mantises go through a simple metamorphosis, meaning that the larval/nymph stages look very similar to the adults, but without wings. Grasshoppers, walking-sticks, and some others also do this. You might not immediately realize that what you have isn’t an adult if you found one. But in the autumn they moult into their last instar, the adult stage, and finally have wings. I’d never had any come to my moth light before. So I was a little surprised to have 13 turn up. There are a number of species in North America, but the most common one, at least that I encounter, is the European Mantis, Mantis religiosa. It’s the one with the black-and-white spots on its inner “arms”. It’s been here over a century and has become pretty widespread in the northeast and the west (the prairies and the southeast don’t seem to have them yet). Another introduced species, the Chinese Mantis, Tenodera aridifolia, is found through much of the east. Like the European Mantis, it has both a green and a brown form, but it lacks the spots on its arms. Beyond that one field mark I don’t actually know how to tell the two apart. Naturally, none of my photos show the inner arm well enough to tell if it’s got a spot on it or not. 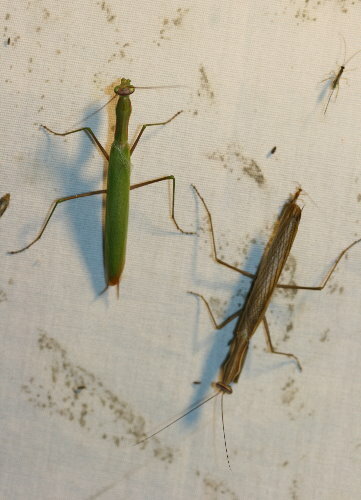 I think possibly the adult Chinese Mantises always have a bold spring-green stripe down the outer edge of the adult’s wing cover, even in the brown form, and maybe a slightly longer “torso”… but that’s just based on comparing photos on BugGuide. If that’s the case, these would all be European Mantises. 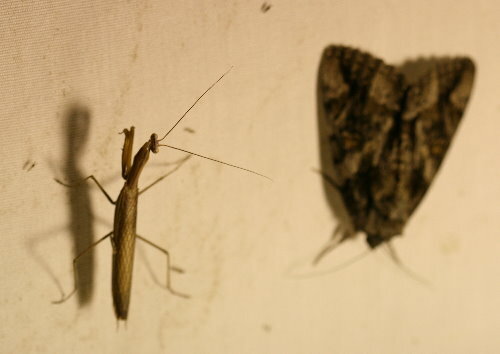 My Kaufman Guide to Insects notes, under Chinese Mantis, “Both sexes fly well and come to lights at night in search of prey”, but this seems also to apply to European Mantises (according to a quick Google search) and a few other native species. Would you consider size a kind of distinguishing field mark? I recently photographed a mantid. Though I couldn’t see its inner arms, it was at least 4 inches long. The Audubon guide suggests that’s too big for a Praying Mantis, so I’m guessing it was a Chinese Mantid? I have only ever caught one european mantis. I live in America we have a lot of chinese mantids.